Card Access Control Security Systems | Web-based Security: cctv cameras and monitoring, door security systems, HID security systems, proximity card readers, biometric access control, cctv surveillance, alarm monitoring - Our access control software can be customized for one security door or for an entire integrated card access system. The System V Card Access Control System was initially designed for medium to large sized systems where volume of card use traffic is high, and instant response times are critical. In recent years the system has been scaled to allow more affordable installation in smaller sites. Our Web-based package and can be viewed with any standard browser. This makes your security system easy to learn and use, reducing your time and cost for training new workers. Set up a Web-based demo. Automatic page or e-mail appropriate personnel, alerting them of unusual activity in your facility. You define what is unusual activity and you define who gets notification (and how). In our 20 year history, no Entry-Master client has ever had their security system compromised by either a hacker or from a virus. 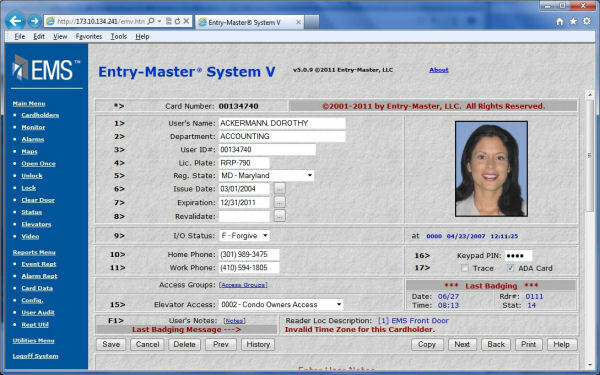 Entry-Master is a registered trademark of Entry-Master Systems, LLC. 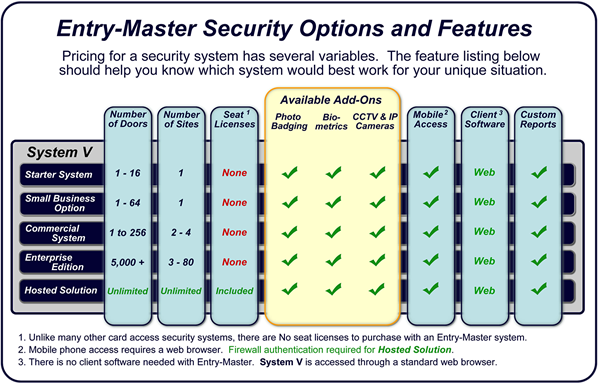 Facts about EMS Security Systems.